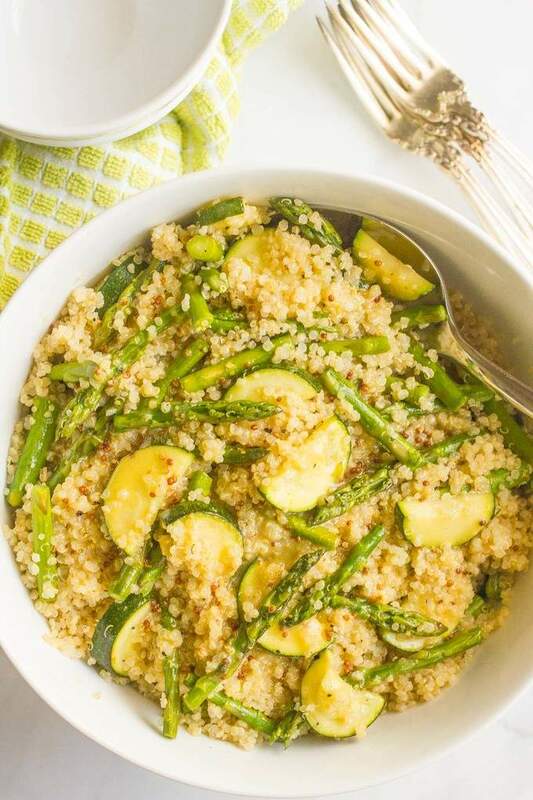 A tangy, tasty quinoa asparagus salad that’s perfect for lunch or as a quick side with dinner! Come spring, I’m ready for fresh, I’m ready for healthy, I’m ready to brush off the cobwebs of dreary weather and embrace some sunshine and outdoor time. 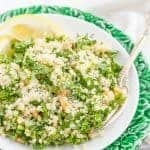 I love this little salad for lunch or as a side dish with grilled fish or meat. It’s also perfect for picnics and potluck parties because you can serve it at room temperature. 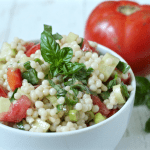 Once the quinoa is cooked, mix everything together and voila, quinoa salad on your table in under 20 minutes. 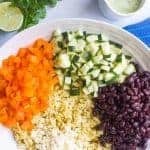 Fast, easy sides make me oh so happy! Particularly when they are this fresh and bright. 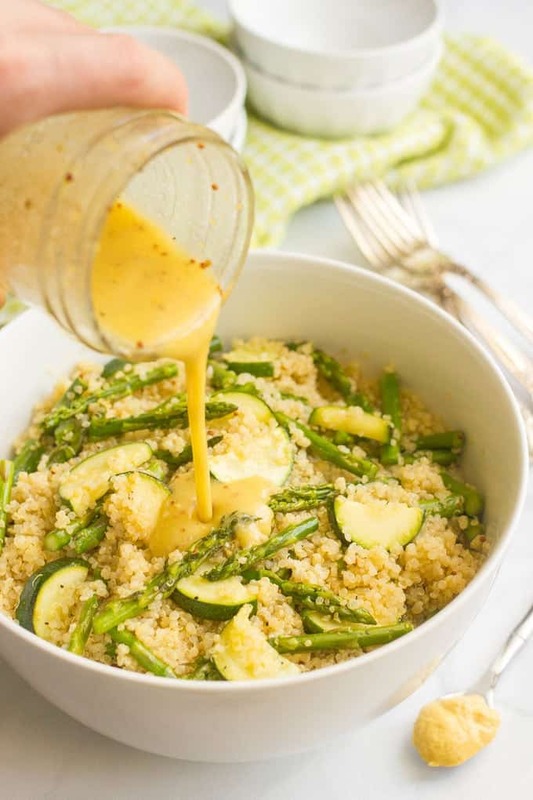 If you’re making this ahead, I recommend you wait to add the dressing until right before you serve it, so that the flavors are still full and bright. 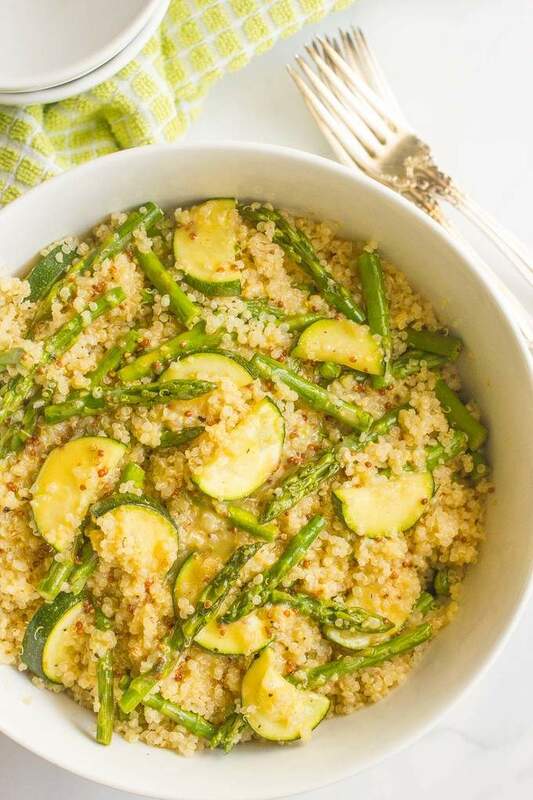 The quinoa will continue to absorb the dressing as it sits, but leftovers are good through the next day – hello, lunch! Welcome spring with open arms! 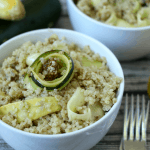 A tangy, tasty quinoa and veggie salad perfect for lunch or as a quick side for dinner! You can sub maple syrup for the honey to make this vegan. Meanwhile, heat olive oil in a medium pan over medium heat. 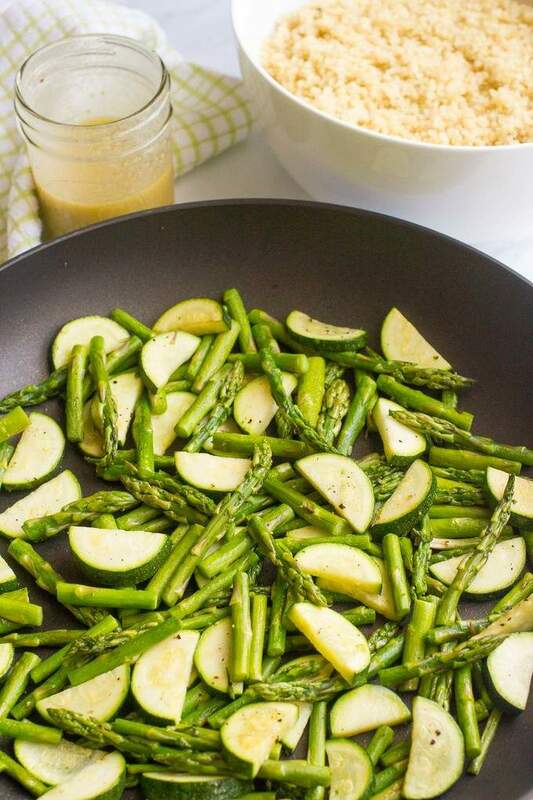 Add zucchini and asparagus and saute for 5 minutes, or until tender (but not mushy). Season with salt and pepper. Meanwhile, make the vinaigrette. Add all of the ingredients to a small jar or container with a lid. Then cover and shake it up. 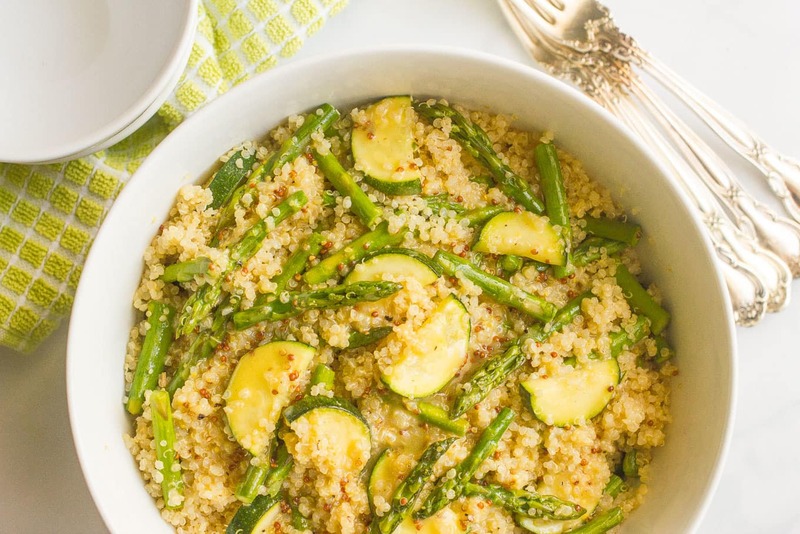 To assemble, combine quinoa and veggies in a large bowl. Add vinaigrette and stir to combine. Season to taste with salt and pepper. 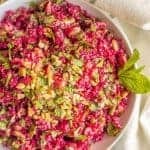 If you are making this salad ahead, keep the dressing separate and add just before serving. 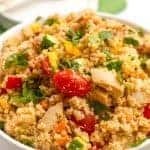 Kathryn, this quinoa bowl looks scrumptious! I love the veggies you paired with it! And the mustard vinaigrette??? YUM!!! Loving the flavors you have going on… healthy without sacrificing flavor. Winner! Cheers and thanks for sharing! Lovely dish and so fresh and vibrant! I can’t wait to try that dressing! Thanks for bringing this by Throwback Thursday! Congratulations…your post has been featured this week in the Friday Favorites Linky Party! !